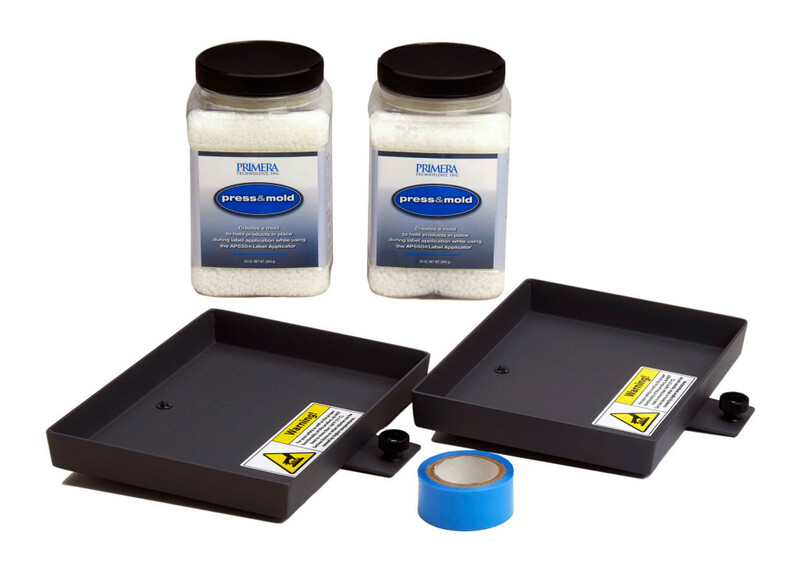 The PRIMERA range of label applicators are always in stock and very popular. AP360e is for automated apply of labels to round containers, can be lipsticks, bottles, jars, card tubes and the like so long as the product is looking like a cylinder the labels can be wrapped round the container in a second so allow a second to pick up the product, a second to apply and a second to take off. 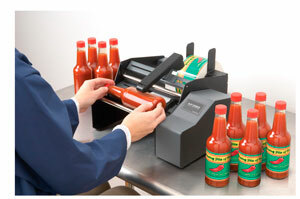 The AP360e help labels to be applied at speeds of say 3 seconds each or 20 per minute. The 'jig' effect of the machine ensures the labels are aligned and applied to the same height up the container each time and so that when labelled and products are on display on a shelf all the labels line up! 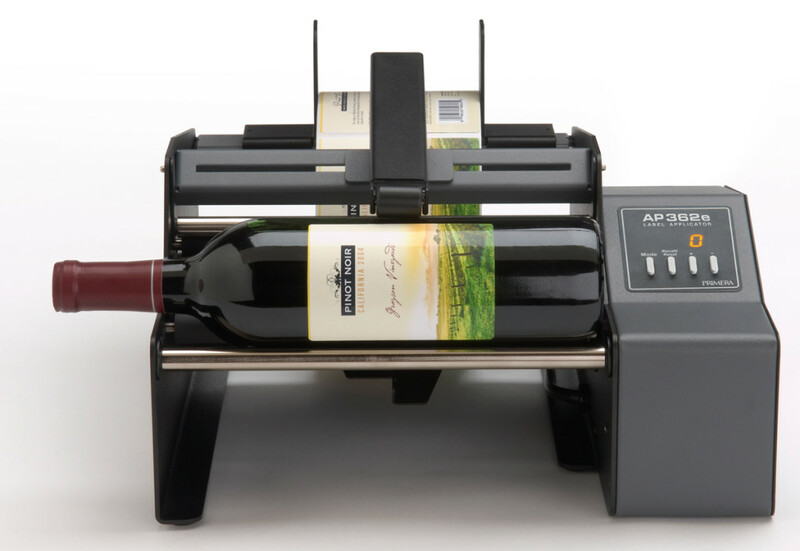 AP362e is similar but adds the ability to apply one label or two labels say one front and back in sequence typically for a wine bottle (as photo) or a shampoo bottle for example where there might be a decorative label for the front and and ingredients/ barcode label for the back. We arrange that the labels are on a roll in a front and back sequence, then the AP362e can be set using the keypad and display to equally space the labels so the front and back labels are exactly opposite on the bottle. Labels should be ideally be outside wound onto a 76mm core so that the drag break working against the core keeps a nice back tension on the roll and so that the labels are applied accurately each time. 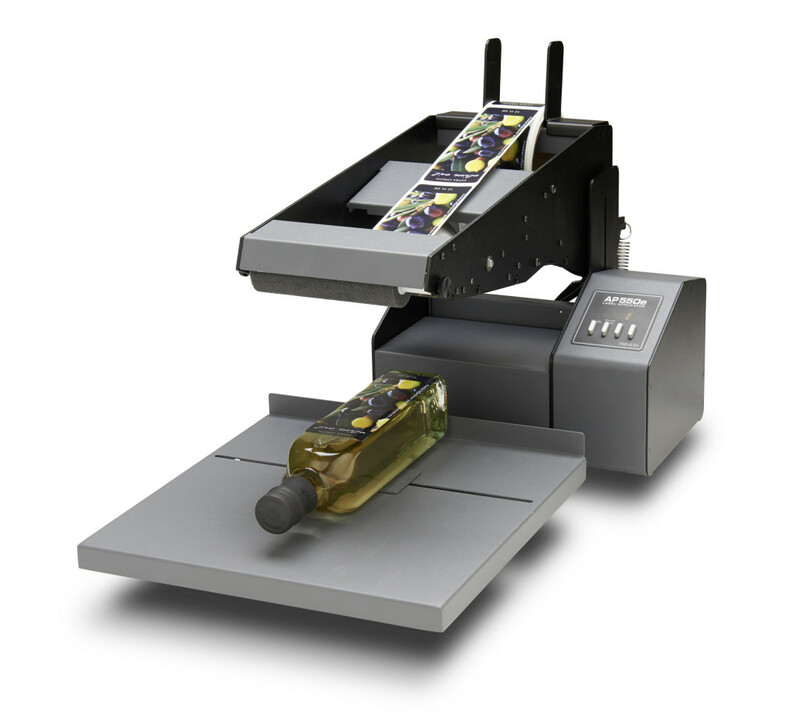 AP550e is a label applicator designed for odd shaped packages and containers. You can see (as photos) the machine is good for square or flat bottles, boxes, cartons, pot lids, bags even awkward shaped containers by building a simple jig to support the container used. The AP550e has a moving table and when the label arm is lowered the table moves towards you and the label is 'swiped' down onto the container. The length of the label can be pre-cut to size on a roll to suit short or long labelling areas. 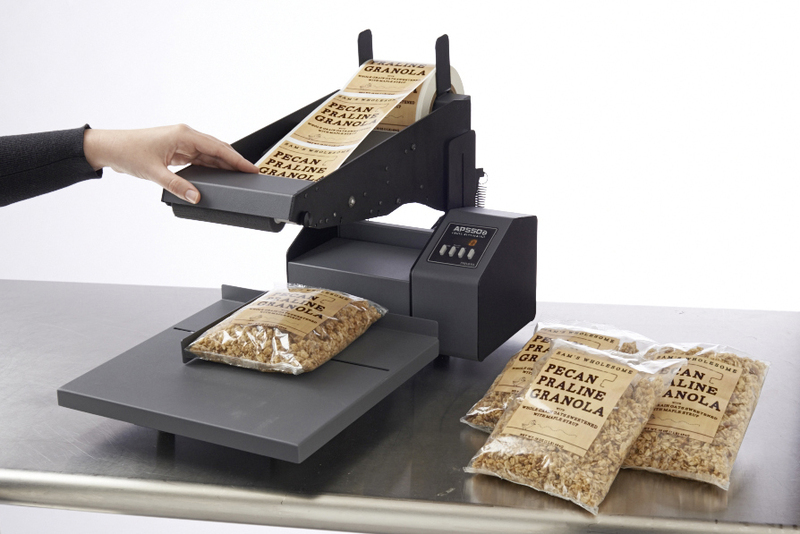 The label can follow the curvature of a filled granola bag or pouch (as photo) for example. The 'jig' used to locate the product onto the table can be made from simple low cost rigid packaging foam cut with a craft knife. For small bottles there are oven activated molding compound kits (small and larger versions with tray) to help make jigs molded to the exact shape of products (as photo) or many customer make their own jig by cutting from wood or plastic so long as it can hold the product and the jig can be fixed to the moving table with say double sided sticky tape all is good for speeding up label apply and with good repeatable accuracy of placement of the labels. Call 044 1527 529713 for advice and free testing with your products.